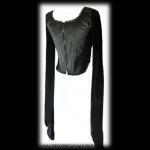 A stunning gothic medieval long-sleeved bodice top made from beautifully soft stretchy black velour velvet with a centre front panel made from burgundy red satin overlaid with black lace extending to the shoulders, black satin ribbon criss-cross lacing and black braid. The bodice has a sweetheart neckline edged with pretty braid and the sleeves are made from velour velvet with a split cuff with braid edging. 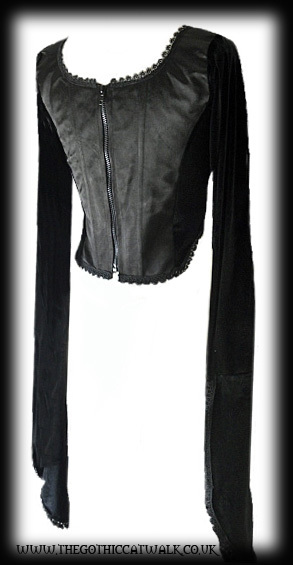 The back has a central panel of black satin and a full length zip. 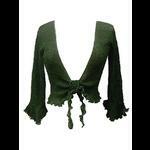 This top is shaped at the front and back meaning the sides are quite short in the body designed to expose the waist. A body or cami top can be worn underneath if you prefer to cover up this area.